Teacher David Meeker, left, shares a laugh as he meets with a high school family during the recent open house. HANNIBAL – With the school year well under way, Hannibal High School students and families recently had a chance to get together for an open house and barbecue. 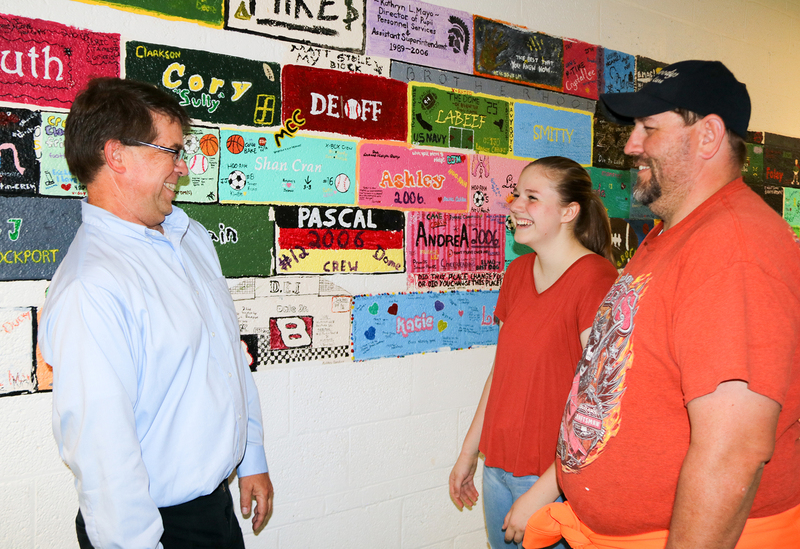 Hundreds of students and family members met with teachers, discussed the curriculum and explored some of the academic and extracurricular options available within the school district. In conjunction with the open house, the High School Family Engagement Committee hosted a pulled pork barbecue and invited several local agencies to set up booths and discuss their services. A representative from SUNY Oswego was also on hand to talk about the financial aid process. Upperclassmen learned about scholarship opportunities, how to fill out the FAFSA and important deadlines when it comes to filing paperwork.